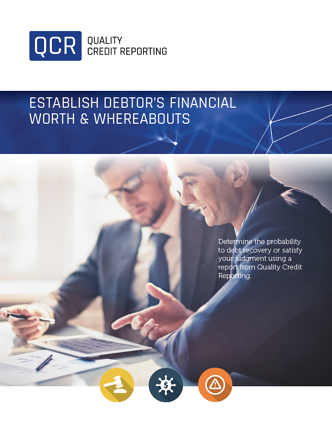 Determine the probability of debt recovery to satisfy your judgment using our Debt Recovery Report. Our reports can aid with the various methods of enforcement and determine the location of the debtor for service purposes. Bank Report: This report is designed to confirm bank accounts for garnishment purposes. The report will provide all information disclosed to us by the financial institution including confirmation of an active account and any account balances revealed. Employer Report: This report is designed to locate the debtor/defendant’s current place of employment for garnishment purposes. The report will confirm the name and address of any employer located, along with any other employment particulars disclosed to us. Real Estate Locate Report: This report is designed to locate real property assets across Canada (subject to availability in each Province) which may be owned by the debtor. The search is designed to also locate matrimonial property and identify possible fraudulent conveyances. Skip Trace (Locate) Report: This report is designed to locate an address for service, which may be a residential or business address.